Life hasn’t been easy for Gabielle Jenny, but she’s proud to be a new resident of Hale Mohalu, an affordable rental housing facility that just opened in Pearl City. Jenny, a single mom, was diagnosed with leukemia in 2013. 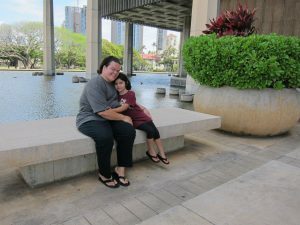 After her recovery, Jenny and her daughter, Michaela, age 5, spent seven months at the Institute for Human Services shelter in Iwilei. Then, they moved to Weinberg Village in Waimānalo, a transitional housing program. “But we needed something more permanent.” So when a friend told her about Hale Mohalu, she “jumped on it” and was picked out of 800 applicants. To qualify, tenants can’t earn more than 60 percent of the area median income.